Edited by Rob Roehm, with introductions and annotations by Rusty Burke. 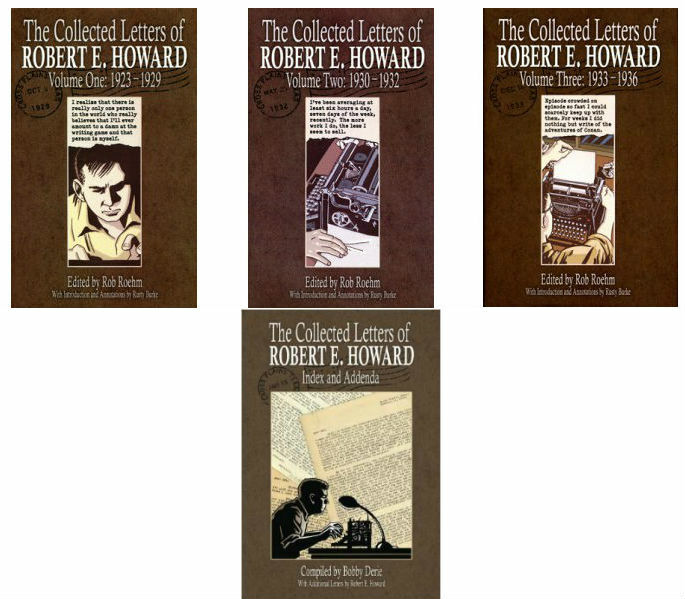 Three volume (1-3) collection of all the letters of Robert E. Howard known to survive in 2008, plus some additional letters discovered later collected (along with the index) in an addenda; letters are unabridged and annotated by Howard scholar Rusty Burke (and Jeffrey Shanks in the addenda), and include reproductions of Howard's drawings in some of his letters. Because of Howard failing to date many letters, scholars have had to determine their order largely by internal evidence. Several letters with unknown dates or recipients are included in volume three, as well as several documents that were included in Howard's letters, and an addendum on 033-0031. Several address lists are included in the Index and Addenda.